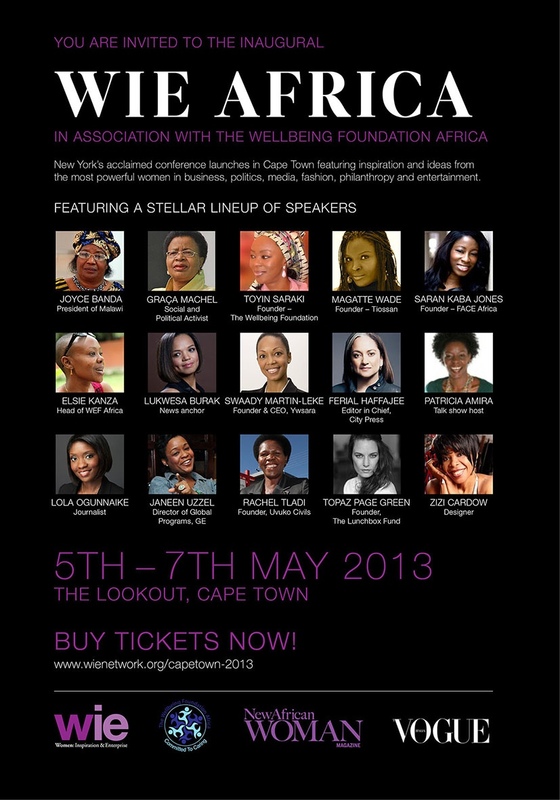 The Women, Innovation, Enterprise (WIE) Network is holding its first ever African symposium in Cape Town, South Africa, from 5th to 7th May 2013. It is set to feature headline speakers such as President Joyce Banda, Graca Machel, Patricia Amira, Saran Kaba Jones, Swaady Martin-Leke and Toyin Saraki. The inaugural WIE Africa is organised in partnership with Mrs. Toyin Saraki’s Wellbeing Foundation Africa . The WIE inaugural conference in Africa features inspiration and ideas from the most powerful women in business, politics, media, fashion, philanthropy and entertainment on the continent and beyond. The first symposium took place in New York and a follow-up in London. With Africa experiencing some of the fastest economic growth in the world, WIE aims to contribute to changing the perceptions of the continent by highlighting the trailblazers taking a central role in shaping the Africa of tomorrow. I want to inform you that you’ve been nominated for the JCI Ten Outstanding Young Persons Award. I would like to send the link to fill the nomination form to you. But first I’d need your email and phone number, so I’d send it to you and for follow up. The nominations are closing on Wednesday, 8th of May, 2013. You can reply to +2347036108580, or mail me on ayo_olayide@live.com. Please reply as soon as possible. Thank you. Reblogged this on Aminu Baba-Ahmed's Perspective.